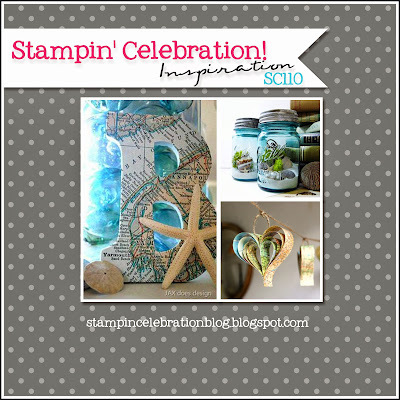 Welcome back to another Stampin' Celebration inspiration challenge (SC110)! I love the images in this pictures! Such fun colors and the map is a fun image to trigger inspiration! I am so happy that Staminp' Up! did not retire the Map background stamp! Background stamps are my favorite stamps. They can add texture and image with little work! For this card I stamped the map image onto Pool Party cardstock using Versamark and then heat embossed the image with black embossing powder. Then I used a sponge a sponged some shading to the map with Top Top Taupe, Mint Macaron and Marina Mist. For the greeting I die cut "cheers" using the Greetings thinlits dies from Tip Top Taupe cardstock and added some black cardstock behind to make the greeting pop. I forgot I used the "cheers" greeting on my last SC project. Guess I love this greeting ;0) It's pretty versatile which is probably why I am drawn to using it. That's all for this card, hope you are inspired to join us for this challenge!